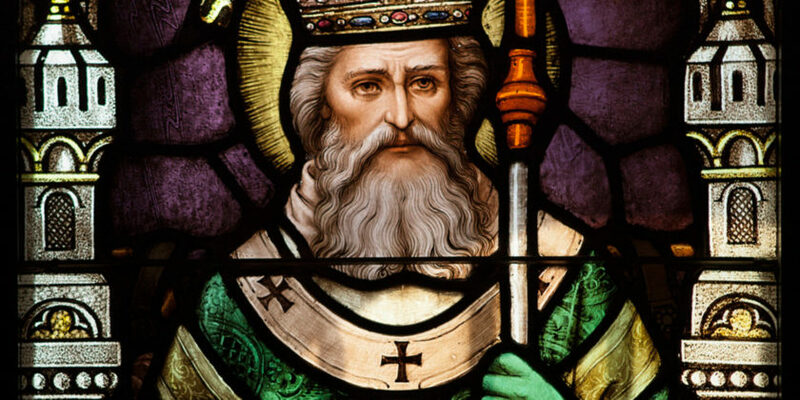 On this day in 461 A.D., Saint Patrick, Christian missionary, bishop and apostle of Ireland, dies at Saul, Downpatrick, Ireland. He is patron saint of Ireland. Born in Great Britain, probably in Scotland, to a well-to-do Christian family of Roman citizenship, Patrick was captured and enslaved at age 16 by Irish marauders. For the next six years, he worked as a herder in Ireland, turning to a deepening religious faith for comfort. Following the counsel of a voice he heard in a dream one night, he escaped and found passage on a ship to Britain, where he was eventually reunited with his family. According to the Confessio, in Britain Patrick had another dream, in which an individual named Victoricus gave him a letter, entitled “The Voice of the Irish.” As he read it, Patrick seemed to hear the voices of Irishmen pleading him to return to their country and walk among them once more. After studying for the priesthood, Patrick was ordained a bishop. He arrived in Ireland in 433 and began preaching the Gospel, converting many thousands of Irish and building churches around the country. After 40 years of living in poverty, teaching, traveling and working tirelessly, Patrick died on March 17, 461 in Saul, where he had built his first church. Irish Times: Do we really want to give Irish passports to all these Brits?